In November 1528, five lifeboats full of survivors from the Narváez Expedition to Florida landed on the Texas coast. These men attempted to make their way from their various landing sites to Pánuco, a Spanish town near what is now Tampico, Mexico. While making this journey southwest along the Texas Gulf coast, four groups of survivors came to body of water that one of them, Alvar Nuñez Cabeza de Vaca, called "Espíritu Santo," which means "Holy Spirit" in Spanish. Most people who study Cabeza de Vaca's route through Texas come to the conclusion pretty quickly that this Espiritu Santo was somewhere around Matagorda Bay. Beyond that, however, there many theories about exactly where on Matagorda Bay the explorers were. The biggest point of disagreement is over whether the men stayed on the outer coast - the long, narrow strip of land known as the Matagorda Peninsula - and crossed Cavallo Pass over to either Matagorda Island or the mainland of present-day Calhoun County, or whether they had been on the mainland all along, and Espiritu Santo was one of the branches of Matagorda Bay, such as Lavaca Bay or Tres Palacios Bay. Determining the exact location of Espiritu Santo is crucial in interpreting the Narváez Expedition survivors' route along the Texas coast. In total, about 95 castaways reached and crossed over it, in different groups and at different times. From there, they went in various directions. Thus, Espiritu Santo was a kind of nexus for the various parties of the expedition. We cannot, therefore, interpret the Narváez Expedition survivors' routes without knowing where Espiritu Santo was, and once we learn where it was, the task of interpreting the rest of their route becomes greatly simplified. The two expedition chronicles - Cabeza de Vaca's autobiographical account, entitled La Relación, and the official report, known as the Joint Report - provide numerous clues of its whereabouts. When we apply those clues to information obtained from historic maps, modern maps, and satellite images of Matagorda Bay, it is possible to fix Espiritu Santo's location with both exactness and certainty. Three times he [Cabeza de Vaca] passed what was a bay. By the landmarks of it, he believed it was the bay which the Spaniards called Espíritu Santo. On the fourth day they [Dorantes's party] arrived at a bay... They suspected it must be the river of Espíritu Santo. They reached a bay which, as already stated, they [Narváez's party] believed was that of Espíritu Santo. We [Cabeza de Vaca and Oviedo] went forward with some Indians until we came to an inlet... From what we saw of it, it seemed to us to be the one called "del Espíritu Santo." There are two peculiar things about these references. First is the variation in describing what kind of body of water Espiritu Santo actually was. The first three quotes are from Thiesen's translation of the Joint Report. They all use the word "bay," but one of them also calls it a river. The fourth quote, from La Relación, calls it an inlet. The Spanish word Cabeza de Vaca wrote here is ancón. Although this can be translated as "bay," which Thiesen did for the Joint Report, it has a different connotation than the other Spanish word for bay, which is "bahía." The word "ancón" is not strictly a nautical or geographical term; it more generally means "bend" or "elbow," after the Greek word for elbow, "ankóna." Cabeza de Vaca used "ancón" to refer to bays that had a narrow opening or bend where they emptied into the ocean, or to the narrow opening itself. In English, these are usually called passes or inlets. The other peculiarity in the above quotes is that none of them actually declare that the explorers were at Espiritu Santo, only that they believed they were. The reason for this is that they thought they had found a place that had already been discovered and named by an earlier explorer. Specifically, in 1519, Alonso de Pineda sailed the entire Gulf of Mexico and made a sketch of it. Pineda noted a large inlet or river mouth at approximately the top center of the Gulf Coast - or at the 12 o'clock position, so to speak. It was, obviously, the Mississippi River. Most historians agree, and a glance at Pineda's sketch will confirm it. (For more information about Pineda's voyage and to see his map, see our article, "Spanish Exploration of the Gulf of Mexico"). When the Narváez Expedition survivors pushed off of the Florida coast and headed west to try to reach Pánuco, they knew they would pass this river, bay, or inlet at some point. How these Spaniards could have not realized they had found the Espiritu Santo when it was sweeping their boats out to sea in October 1528 is hard to understand. Their belief that they had now found it over 400 miles from its actual location goes to show how utterly lost these men truly were. Perhaps the fact that they qualified their statements by writing things like "they suspected that it must be..." means that they had realized their error by the time the chronicles were written. Subsequent Spanish explorers used the name Espiritu Santo to refer to several areas on the Gulf Coast, including Tampa Bay, but not the Mississippi River delta. Spanish explorers in Texas, apparently taking their cue from Cabeza de Vaca, used it to refer to Matagorda Bay. In 1722, Spain built the Mission Espiritu Santo and Presidio La Bahia ("The Bay") at the head of present-day Lavaca Bay, the northwestern body of Matagorda Bay. The presidio and mission were moved west to the Guadalupe River a few years later, however, and the name moved with them. 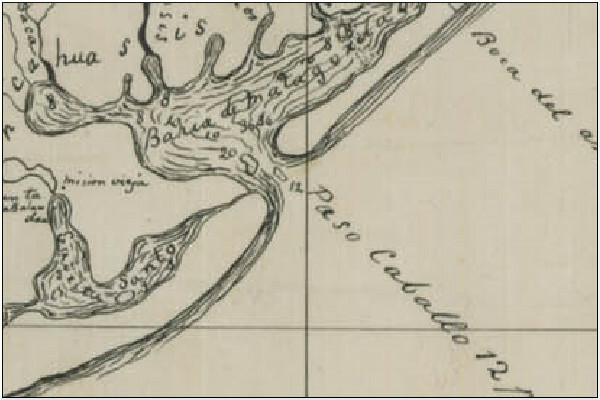 A map drawn by Stephen F. Austin in 1829 has all of present-day San Antonio Bay, including the long section between it and Matagorda Bay, labeled "Espiritu Santo." This is the convention on Texas maps in the 1840s and 1850s, with some labeling present-day Matagorda Island as "Espiritu Santo Island." Between the 1850s and 1880s, the name Espiritu Santo shifted to refer specifically to the body of water between San Antonio Bay and Matagorda Bay. Order your copy of The Account of Cabeza de Vaca: A Literal Translation with Analysis and Commentary, translated by David Carson of TexasCounties.net, available in E-book and paperback formats. Note that this passage explains why the Spaniards believed the inlet they found was the Espiritu Santo shown on Pineda's map: they thought it was able to be seen "from far out at sea," i.e. from aboard a sailing ship such as the one Pineda used in charting the Gulf of Mexico. Wherever Espiritu Santo was, the Narváez Expedition members knew that Pineda was able to see it from his ship. This bay or inlet at Matagorda Bay must have been the first one they saw - not San Luis Pass, and not the mouth of the Brazos - that seemed as if it would be visible from a distance. The specific reason this inlet was highly visible was because of its "very large knolls of white sand." The presence of sand dunes ought to be sufficient in and of itself to prove that the travelers were on the sea coast, not on the shore of a protected bay on the mainland. Sand dunes form on beaches that are directly exposed to ocean winds. The idea of large sand dunes, able to be seen "from far out at sea," forming on the mainland of Matagorda Bay is, in a word, absurd. Cabeza de Vaca's brief description of Espiritu Santo calls it "an inlet that is one league across and deep everywhere." By writing, "From what we saw of it, it seemed to us to be the one called 'del Espíritu Santo',"2 he echoes the sense given in the Joint Report that certain landmarks or features of the inlet made it appear to be the bay Pineda recorded, but unlike the Joint Report, Cabeza de Vaca does not elaborate on what these features were. They observed a river (presumably the Brazos) flowing powerfully "into the sea." They ate shellfish and seaweed during the journey. Governor Narváez, still in his boat, chanced upon Comptroller Enríquez's party, who was walking on land. Narváez's boat was carried off to sea by a north wind, and never seen again. 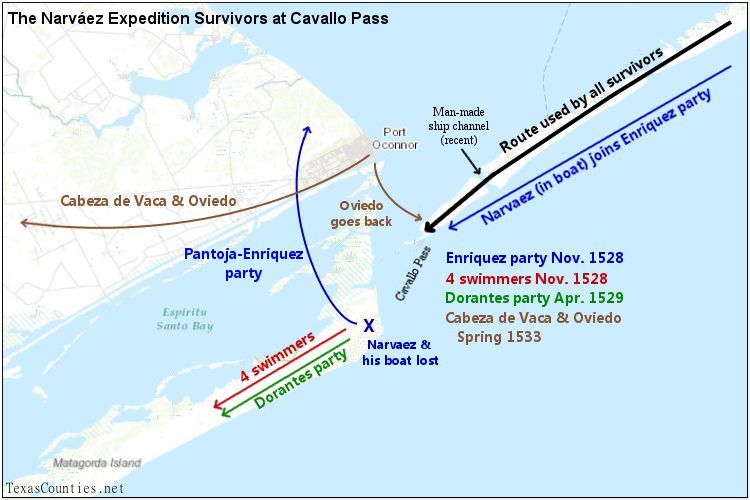 While one could argue that there were multiple groups of survivors traveling at different times - the Enríquez/Narváez group, the four strong swimmers, Dorantes's party, and Cabeza de Vaca and Oviedo - and they may not have all taken the same route, the fact is that there is not a word of evidence in either La Relación or the Joint Report to support the theory that any of the travelers went by an interior route for any part of the trip between the Isla de Malhado and Espiritu Santo. Figure 1. Satellite photo of Cavallo Pass. The ship channel at the top right was completed in 1966. Since the ancón, or inlet, of Espiritu Santo had to be on the coast of Matagorda Bay, and it was the first significant bay or inlet the explorers encountered along the Texas coast since leaving the Isla de Malhado, there is only one place it could be. Cavallo Pass, often called Pass Cavallo, is the large inlet between Matagorda Island, in Calhoun County, and Matagorda Peninsula, in Matagorda County. It was originally called "Paso Caballo," or "Horse Pass." It is the largest natural inlet for Matagorda Bay and San Antonio Bay and is the natural outlet to the Gulf of Mexico for the Colorado, Guadalupe, and San Antonio Rivers, as well as all of the creeks and other streams in the vicinity. Today, there are other inlets or passes on the Matagorda Peninsula, including a man-made ship channel about 4 miles east of Cavallo Pass, and a channel for the Colorado River, which was cut in 1935. There are a few other places where the thin, low peninsula is submerged, such as Mitchell's Cut, where the peninsula connects to the mainland, but these cuts are so small and shallow that they have repeatedly closed and reopened. In Cabeza de Vaca's time, a person starting at the east end of Matagorda Peninsula and walking west would not encounter any deep or wide water until reaching Cavallo Pass. Figure 2. 1867 U.S. Coast Guard map of Cavallo Pass. The former site of Saluria is indicated, as is the original lighthouse location. The lighthouse was moved about 2 miles to the southwest in 1873. In the recent satellite photo shown in Figure 1, Cavallo Pass is only 2,000 feet wide and is hard to recognize from the expedition chronicles' description of it as "almost a league wide" and "deep everywhere." It has filled in considerably in recent times, however. 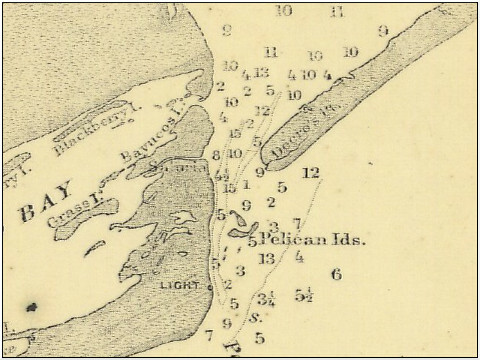 Compare that photo with Figure 2 at right, which is from an 1867 U.S. Coast Guard map. Note that almost the whole eastern tip of Matagorda Island is new, as well as some of the western tip of Matagorda Peninsula. Even on the 1867 map, the pass is only about a quarter of a league wide, but there is some evidence that had been steadily narrowing before then. On his 1829 map of Texas, Austin drew the pass as positively large and noted its depth as "12 feet permanent." A section of this map is presented below in Figure 4. This map is obviously not to scale, but it nevertheless suggests that in 1539 this inlet could actually have been "almost a league" wide, just as the chronicles described it. 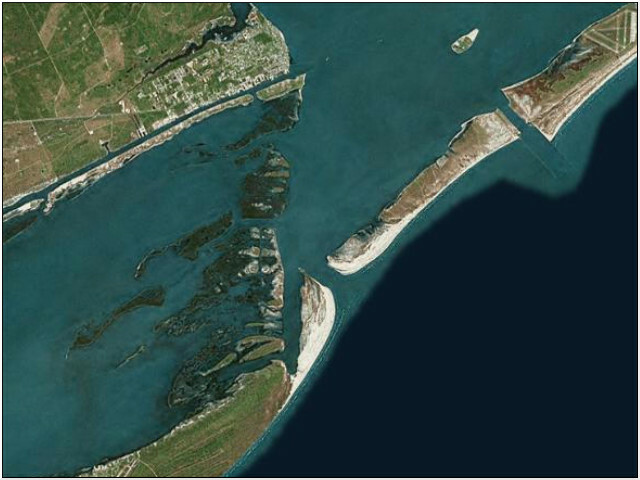 The "point of land" in the Joint Report's description of this large inlet seems to refer to the way that the east end of Matagorda Island and the west end of the Matagorda Peninsula meet at a diagonal, with Matagorda Island sticking out to the south. This is especially noticeable on the 1867 map. It is no surprise that a lighthouse was built on this "point of land which went almost one-quarter of a league into the sea." The "very large knolls of white sand" that were big enough to serve as "landmarks," big enough to be "visible from far out at sea," and the main reason the survivors believed they were at Espiritu Santo apparently still existed when Davenport and Wells wrote their findings in 1918, but they no longer do. Still, the tendency for sand to accumulate at Cavallo Pass is clearly evident in the satellite photo in Figure 1. Figure 3. The Narváez Expedition at Cavallo Pass. About 95 members of the Narváez Expedition crossed Cavallo Pass in four groups. Their approximate routes are represented on a modern map in Figure 3, at right. The first group of Narváez Expedition survivors to reach Cavallo Pass consisted of approximately 80 men. A boatful of about 40, commanded by Comptroller Alonso Enríquez, stopped near the mouth of a river, most likely the San Bernard in Brazoria County. For reasons the chronicles do not make clear, the boat could not be used anymore. The men left it and began walking southwest along the Texas coast. Before they reached the end of the Matagorda Peninsula, another boat from the Narváez Expedition pulled up beside them. Governor Pánfilo de Narváez, the leader of the expedition, had managed to keep his boat intact. This meeting was the first sign of other survivors that either party had seen since reaching Texas. Using the one good boat, Narváez ferried everyone across Cavallo Pass, making at least two trips. The date was probably around November 12, 1528. Figure 4. This section of the east end of Matagorda Island is directly across from Decros Point on the Matagorda Peninsula, where Cavallo Pass was historically the narrowest. All of the Narváez Expedition survivors who crossed Cavallo Pass probably landed near here, and it may be where Narváez's party made camp the night he was lost. The town of Saluria was later established here. Prior to around the mid-1900s, the land here was higher and drier than it is in this photograph. With their commander gone, the rest of the survivors continued a little further, then crossed over to the mainland. We do not know what the terrain of east Matagorda Island was like in 1528, but we do know that for most of the 1800s and 1900s, it was higher and drier than it is today. It is reasonable to assume, therefore, that the party now under Pantoja's command was able to cross over to the mainland with less difficulty than such a crossing would entail today. The next group of survivors to reach Cavallo Pass were four men who had landed on the Island of Misfortune. Two boatsful of survivors had landed on this island or peninsula on November 5 and 6, 1528. After attempts to launch both of their boats failed, they decided to send their four strongest men, who were all good swimmers, with a native guide to try to reach Pánuco quickly and send help back for the rest of them. These four strong swimmers were named Álvaro Fernández, Méndez, Figueroa, and Astudillo. They probably left Follet's Island on about November 11. They had several days to rest and recuperate from their sea voyage and would have traveled down the coast faster than Comptroller Enríquez's large group. They were probably no more than a day behind them by the time they reached Cavallo Pass. It is unknown how they crossed it, but they did not have a boat, and they never caught up with the large group, so it may have taken them some time to either make rafts or find some natives to take them across in canoes. Once they crossed Cavallo Pass, they continued making their way southwest by walking down Matagorda Island. The group of strong swimmers is the only one of the four groups of Narváez Expedition survivors for whom the expedition chronicles do not explicitly state that they crossed Espiritu Santo. Their crossing of Cavallo Pass can be deduced, however, from the fact that two of them were captured (the other two and their guide had died by this time) at an inlet that can be identified as Cedar Bayou, on the west end of Matagorda Island. In April 1529, Andrés Dorantes led a party of men who had survived the winter on the Island of Misfortune down the coast in search of Pánuco. These men made rafts to cross two of the rivers along the way and were taken across another river by natives in their canoes. At its largest, Dorantes's party had thirteen members, but four died before they reached Cavallo Pass. The men found a damaged canoe on the east side of the pass and used it to cross over to the west side. The Joint Report does not say whether all nine of them could fit in the canoe, or whether they had to make multiple trips across the pass; it says only that they were at the pass for two days. They completed their crossing on or about April 9 and then proceeded walking down Matagorda Island. Cabeza de Vaca visited Cavallo Pass three times after Dorantes left the Island of Misfortune with the bulk of the survivors. The first two times were during his years as an itinerant trader. Cabeza de Vaca writes in La Relación that he spent the winters on the mainland across from the Island of Misfortune, and the rest of the year, he traveled throughout the land, trading in shells, beads, and other items the natives valued. He writes, "I journeyed inland as far as I wished, and I extended forty or fifty leagues along the coast. "7 The Joint Report states that he "went farther up along the coast for a distance of forty leagues, and three times he passed what was a bay. By the landmarks of it, he believed it was the bay which the Spaniards called Espiritu Santo. "8 On his third trip to Espiritu Santo, Cabeza de Vaca brought Lope de Oviedo, the only remaining survivor on the Island of Misfortune, with him. The distance from San Luis Pass to Cavallo Pass is about 90 miles, or 26 Spanish common leagues. The discrepancy between the actual distance and the distances written in the texts is one of the main reasons some Cabeza de Vaca route interpreters theorize that either the Island of Misfortune was not Follet's Island, Espiritu Santo was not Cavallo Pass, or both. This is not a strong argument, however. We see a consistent tendency for the expedition chronicles to overestimate long distances, and the longer they are, the worse the error. Additionally, if Cabeza de Vaca was visiting various native tribes to trade with them, he may not have been going in a straight line, and therefore might not have known how far away from the Island of Misfortune he had traveled. The Joint Report also states that he went forty leagues and "passed" the bay, so the bay may have been closer than forty leagues. There are many reasons, therefore, to treat the text's figure of 40 leagues to Espiritu Santo as a rough estimate. Diligent route interpreters will always subordinate the distances and numerical measurements given in the texts to information that is less error-prone. In the spring of 1533, Cabeza de Vaca and Ovideo arrived at Cavallo Pass together. The Deaguanes, a tribe who lived in the East Matagorda Bay area, took them across Cavallo Pass and onto the mainland of present-day Calhoun County, where the Quevenes lived. The Quevenes reported to them that six of their people had been taken as slaves by a neighboring tribe. They further reported that these natives had killed three of the six, and the other three were being abused. The Quevenes said they would take Cabeza de Vaca and Oviedo to their three countrymen who were still alive. Cabeza de Vaca writes that the Quevenes then began hitting him and Oviedo. With this, Oviedo became afraid and went back with the Deaguanes. What became of him after that is unknown. Cabeza de Vaca continued on in search of his comrades. Figure 5. Section of Austin's 1829 map of Texas showing Espiritu Santo Bay and Cavallo Pass. The map is obviously not to scale, but it does show the pass as quite wide. Note that the name Espiritu Santo originally referred to present-day Matagorda Bay, but when the Mission Espiritu Santo moved west to the Guadalupe River in the 1720s, the name "Espiritu Santo Bay" moved with it. As the only natural inlet to Matagorda Bay and San Antonio Bay, Cavallo Pass has always been involved in Texas history. The first European to visit it after Cabeza de Vaca and Oviedo left was French explorer Robert La Salle. In 1685, La Salle brought 3 ships and about 300 people to Matagorda Bay with the intention of founding a colony. One ship was lost in Cavallo Pass. La Salle established his short-lived colony at Garcitas Creek. In 1691, Domingo Terán, the Spanish governor of Coahuila, had a supply ship sail into Matagorda Bay to support his overland expedition to east Texas. In the 1700s, the Spaniards established a mission and presidio on Matagorda Bay. The prosperous mission and its fort were moved several times and, under the Mexican government, became the town of Goliad. Despite the importance of Matagorda Bay to the French, Spaniards, and Mexicans, no attempt was made to settle the area of Cavallo Pass itself until after the Texas Revolution. In 1837, Thomas DeCrow established a settlement on the western tip of Matagorda Peninsula. There was a town with a post office and schools in the 1840s and 1850s. Across the pass, on Matagorda Island, the Republic Congress authorized the establishment of the town of Calhoun in 1841. This town never materialized, but in 1847, the town of Saluria was established. It received a post office in 1848. The United States government built a lighthouse near Saluria in 1852. Figure 6. 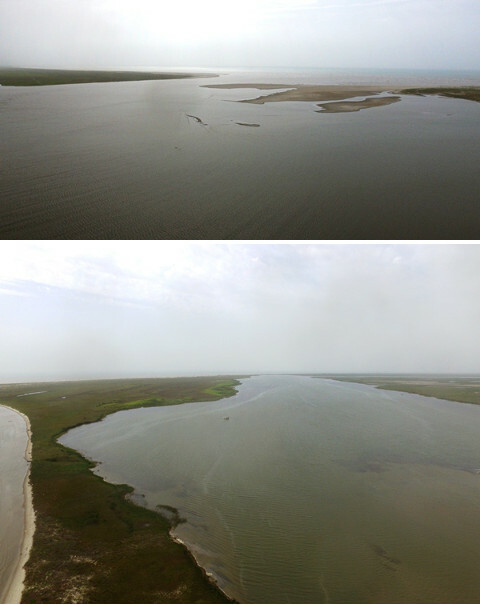 Top: Cavallo Pass in 2016, viewed from Matagorda Bay, with Matagorda Peninsula on the left. 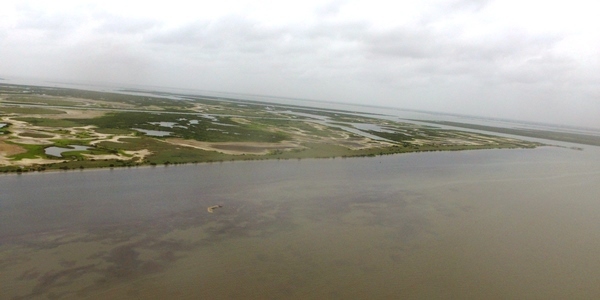 Bottom: Cavallo Pass and the east end of Matagorda Island, looking southwest. The large peninsula on the left side of the photo did not exist before the 1970s. This section of the pass is now closed at its south end. Because of its strategic role in shipping and commerce, the Union and the Confederacy fought for control over Cavallo Pass during the Civil War. Confederate artillery at Fort Esperanza, near Saluria, kept Union ships at bay for two years, but on November 29, 1863, rebel forces retreated to the mainland, and federal forces captured the pass. The residents of the towns on both sides of the pass had evacuated at the outset of hostilities, and the buildings were destroyed during the war. Attempts to resettle and rebuild the towns after the war were thwarted by a series of hurricanes. Their names are all that remain: the western tip of Matagorda Peninsula is still called Decros Point, and the bayou separating Matagorda Island from the mainland is called Saluria Bayou. The United States government built a Coast Guard station at the old townsite of Saluria 1879. The rest of the lands on both sides of the pass were primarily used for ranching the rest of the 1800s and the early 1900s. After the U.S. entered World War II, the government seized Matagorda Peninsula and Matagorda Island for use as training grounds for bombers. The peninsula was returned to private landowners after the war, but the Air Force remained on the east end of Matagorda Island until 1975. The island was then converted to state and federal nature preserves. The land on the west side of Cavallo Pass is now operated by the Texas Department of Parks and Wildlife. The lighthouse was moved to its present location in 1873 and has been restored numerous times, most recently in 2004. The terrain at Cavallo Pass has changed noticeably since the mid-20th century. The delta that formed across the Colorado River in the 1930s separated East Matagorda Bay from West Matagorda Bay. According to a 2006 report by the U.S. Army Corps of Engineers, this reduced the amount of water flowing through Cavallo Pass by tidal action by 12 percent. A ship channel that was built through the west end of Matagorda Peninsula in 1966 cut down the flow of water through Cavallo Pass even further. Consequently, the pass has filled in substantially, with both the west end of Matagorda Island and the east end of Matagorda Peninsula growing towards each other. Cavallo Pass is now barely a quarter of a mile wide, if that, and is deep enough only for small boats. At the same time, much of the east end of Matagorda Island, where Saluria, Fort Esperanza, and the U.S. Coast Guard station were, is now marsh or fully underwater. A state-operated ferry to Matagorda Island burned in 2004. Since then, both sides of Cavallo Pass have been accessible only by private aircraft or watercraft. 5The Joint Report's account is probably more accurate, since Cabeza de Vaca only heard about these events from the other two contributors to the Joint Report, Dorantes and Castillo.